Water is arguably the most important nutrient for pigs. Limited water availability will reduce feed intake and, thus, have negative effects on growth performance. 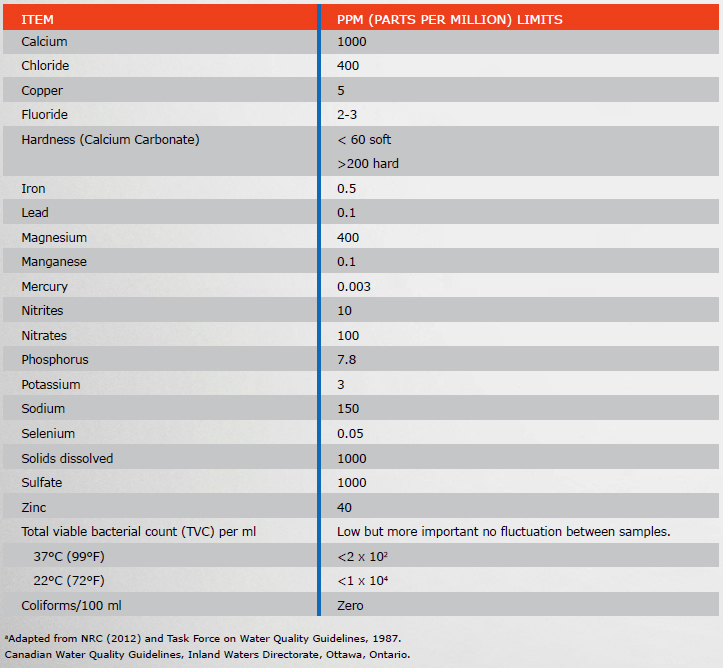 Two key aspects for successful production are water availability (Table F1) and water quality (Tables F2 and F3). Total dissolved solids is not an exact measure of water quality but can be used to estimate water quality. Sulfates are laxative agents and can cause diarrhea, especially in young pigs (NRC, 2012). Different countries may have different water quality standards for pigs. For an extensive review of water in swine nutrition refer to Thacker (2001) and PIC Sow and Gilt management manual at http://na.picgenus.com/resources.aspx. TABLE F1. MINIMUM WATER INTAKE TARGET BY PHASE OF PRODUCTIONa. TABLE F2. WATER GUIDELINES FOR PIGSa. TABLE F3. EVALUATION OF WATER QUALITY FOR PIGS BASED ON TOTAL DISSOLVED SOLIDS (NRC, 2012).